Between Oxfam’s report claiming that 1 percent of the world’s population will soon own 50 percent of its wealth and perennial presidential candidate Mitt Romney’s new packaging as an anti-poverty warrior, it’s understandable if most people just want to throw up their hands (and maybe their latest meals) in utter frustration, discouragement and anger. Naturally, if you’re not among the 1-percenter billionaires, it’s easy to think that no individual could possibly make a difference in anything. But that kind of I’m-on-my-own thinking is precisely what keeps people from acting. It’s no coincidence that those few at the top of the income scale insist that individuals alone are responsible for overcoming all obstacles to improving their situations, that unions and government regulation threaten freedom and that their own advantages of wealth, the best schools and knowing the right people had nothing to do with their success. 1. Pick a couple of potential candidates for elective office and find out how they voted in the past on taxes, regulation of banks and Wall Street, student loans, unemployment insurance, the minimum wage, Medicaid, corporate incentives and other pocketbook issues. Never mind what they say. Past actions, not campaign promises, are the best predictors of what they’ll do in the future. 2. If you find a candidate whose voting record pleases you, spend that weekly hour working for his or her campaign. 3. Don’t overlook people running for local offices. They have a great impact on where you live. And just for fun, take a look at how self-described capitalist tool Forbes magazine tries to discredit the statistical validity of Oxfam’s findings. Using Oxfam’s charts, Forbes proclaims that there isn’t enough data to reliably predict when or if Oxfam’s 50-percent conclusion will come true. What the charts show has already happened, however, is that between 2000 and 2014 the world’s 1-percenters owned between 44 percent and almost 49 percent of the globe’s wealth. It’s always easy to talk ourselves out of taking action. But if you’re willing for just one day to stop talking yourself out of doing anything about the problems afflicting us all, including you, then this Tuesday, May 1st is the day. 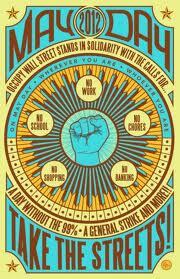 May Day, born in Chicago in 1886 during the push for an 8-hour workday, has become an international holiday honoring workers. This year, the Occupy movement is suggesting and orchestrating protests ranging from quiet, individual acts to mass demonstrations. So Tuesday, May 1st is when to do it. Here’s how: Get mad. It shouldn’t be hard. All of us in the 99 percent have been screwed over one way or another, and often more than one way. Anger is the best means of overcoming inertia or hopelessness, which probably is why so many authorities constantly caution us against the “dangers” of anger. From best-selling authors to preachers in pulpits, those who claim to know what’s best for us warn that anger will hurt us. We must move on, leave it behind, forgive and forget or risk the terrible consequences of a supposedly corrosive, self-destroying emotion. Even assuming all of these people are well-meaning and sincere, the advice is misguided. In fact, it’s baloney. Anger is the bedrock of a so-called bad attitude. And throughout human history, people with so-called bad attitudes have propelled some of the biggest advances in society by defying authority and protesting injustice. Anger surfaces at the moment delusion dies, helping clear the fog of lies, half-truths, wishful thinking, propaganda, denial and conventional wisdom to reveal stark reality. Anger is the fuel that propels people to act, and to persist in spite of obstacles ranging from ridicule to death threats. What caused slaves to run away or revolt, women to protest, workers to organize? They were monumentally pissed off and tired of not doing anything about it. Anger is not to be confused with rage, bitterness or hatred. As energy, it is best used when cool and harnessed to a thoughtful plan of action, instead of letting it drive you to lash out in a heated reaction of the moment. So get mad and don’t let anyone try to talk you out of your anger. Plan how you want to act on it. You might be surprised, afterward, by how much better you feel. Isn’t that reason enough? The howls of outrage about General Electric’s avoidance of U.S. corporate taxes are likely to die down soon to whimpers about how unfair it is and shoulder-shrugging from people thinking, What can I do about it, anyway? Millions of us have the time, being unemployed, as well as highly educated, experienced and motivated. We know the American middle class has been under assault for decades, an attack propelled by lies about the “burdens” on corporations, obfuscations about competitiveness and empty promises about job creation. It’s time to stop listening to people whose private club bills amount to more than the average annual income when they insist that paying living wages and decent benefits will hurt us. We have only to look to China to see what Big Business means by “competitiveness.” It means slaving 12 hours a day, six or seven days a week, for pitiful wages in dangerous conditions, a metal cot in a room shared with many others and meals of rice and broth. The Chinese government works hand-in-hand with Big Business to ensure that its people have no options. This allows Big Business to profit and the government to rule unchallenged. Do you know how they do it? By not allowing people to protest or organize. At the first hint of any such activity, Chinese citizens are punished with job loss, beatings, arrest, imprisonment, involuntary commitment to police-run mental “hospitals,” disappearance and murder. Think that can’t happen here, that such a notion is far-fetched hysteria or exaggeration? Look at our labor history. With the willing aid of government, Big Business repeatedly crushed workers all across this country who protested. You don’t need to take my word for it, nor should you. Find out for yourselves. As individuals, we are helpless, caught by forces we can’t control and circumstances we didn’t create. But in organized groups, we can apply enough pressure to pry capitulation from the powers that be. Big Business understands that. Why do you think it has made such a sustained assault on unions? It’s no accident that our golden age of economic security, when a single wage earner could support an entire family, coincided with the union-driven expansion of the middle class and higher taxes on corporations and wealth. Notice also that those higher taxes did not prevent American corporations from innovating and growing. But greed knows no limits. When violence failed, Big Business turned to the tried-and-true tactic of the Big Lie. Paying minimum wages will cost jobs. Paying taxes will cost jobs. Observing safety standards will cost jobs. Fairness in hiring will cost jobs. In truth, paying exorbitant executive salaries, avoiding taxes and bowing to the dictates of Wall Street cost jobs. After years of declining wages and unemployment, many of us are frightened and demoralized. It’s time to turn those feelings outward and use them as fuel for action against those who cause or abet these conditions. We could start by directing our outrage at two of the people who have responsibility for working conditions in our country: GE CEO Jeffrey Immelt, recently appointed jobs-creation czar, and President Barack Obama, whose choice of Immelt for that position is perverse. Flood their offices with messages of protest. Bombard their websites with mass complaints. Mail them copies of your mortgage foreclosures, layoff notices and unemployment applications. Arrange flash mobs to arrive wherever they go. Show up outside their homes, their offices, their country clubs, their business meetings, their vacation getaways, their appointments, appearances and speeches with protest signs, street theater, demands and heckling. Our Declaration of Independence tells us we have not just a right to rebel against tyranny and injustice, we have a duty to do so. If we allow ourselves to give up, tell ourselves we haven’t got the time, the money or the nerve to raise righteous hell, we’ll continue to be shafted. And we’ll deserve it. How many times have we been counseled about the dangers of anger? From best-selling authors to preachers in pulpits, those who claim to know what’s best for us warn that anger will hurt us. We must move on, leave it behind, forgive and forget or risk suffering the terrible consequences of a supposedly corrosive, self-destroying emotion. Even assuming that all of these people are well-meaning and sincere, the advice is misguided. In fact, it’s baloney. Anger is the bedrock of a so-called bad attitude. Anger surfaces at the moment delusion finally dies, helping clear the fog of lies, half-truths, wishful thinking, propaganda, denial and conventional wisdom to reveal stark reality. Why did American colonists revolt? What caused slaves to run away, women to protest, workers to organize? They were monumentally pissed off, as are the thousands of people in multiple states protesting attacks against public employees’ unions. Don’t let anyone try to talk you out of your anger. It’s there for a reason. Find that reason, and do something about it.